Monochrome bottles prior to the late Qianlong period are relatively rare. One of the monochrome colours that best overcomes the drawbacks of plain coloured surfaces for a miniature art form is the ‘robin’s-egg’ glaze. This is fired at a lower temperature than many monochrome glazes, and is the result of feathering two different colours of glaze together, creating an endlessly fascinating pattern that makes the surface far more interesting to the eye than a plain colour, enlivening the work of art in the hand. Identifying monochrome snuff bottles is difficult, as they were not usually reign marked. No recognizable articles of this type from the Yongzheng era have survived. They were certainly produced during the Qianlong period, however; we just don’t know how early in the reign. 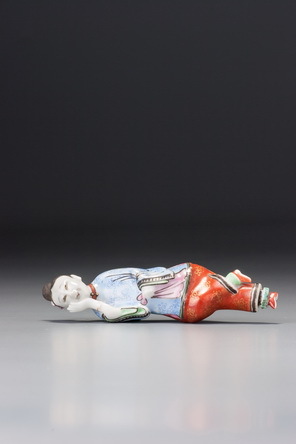 The quality of the glaze here indicates a likely Qianlong date, possibly an early one. The uncompressed double gourd was seen in early-Qianlong courtly production, but it would be premature to date this bottle so early without further corroboration. The uncompressed form may have more to do with its source of inspiration than its date within the reign. 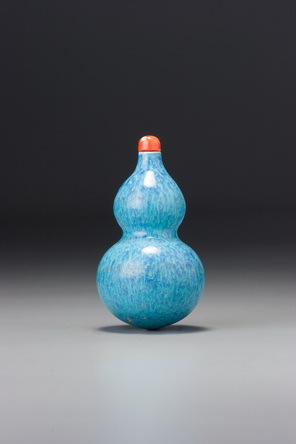 Larger equivalents of this shape from the Qianlong imperial kilns are always uncompressed, and a late-Qianlong potter may simply have miniaturized an existing vase form that inspired him in the making of this bottle. The unglazed interior may also indicate a later-Qianlong date, although it would be rash at this stage of our knowledge to assume that the rules applying to enamelled porcelains would necessarily apply equally to all other ceramic types. Larger vessels of this form and with this distinctive feathering of the two colours were made for the court, so there is no reason why this should not be imperial, even if unmarked.